Your entire CSAT dataset is directly accessible via our Dropbox integration. And that's great because CSAT captures a lot of very useful data, every single time one of your clients records a reaction. Of course, having access to that dataset is just the first step. You also need to know what's in there -- and how to use it. The more information you can effectively analyze and report on, the better your business can be. We've got you covered on that too. Our brand new CSAT Data Resource Guide tells you everything you need to know about the data elements in your CSAT dataset. With this data at your fingers tips, you can use external tools like BrightGauge, Excel, and Microsoft PowerBI for in-depth custom reporting. 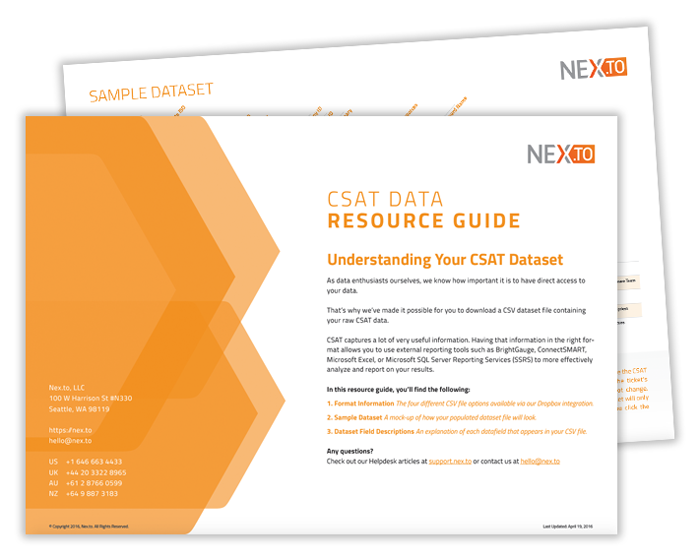 Download the CSAT Data Resource Guide now to get more out of your CSAT dataset.